Hobbies away from birding took up much of my time last weekend but that didn't stop me from getting out on a couple of occasions. The most enjoyable of these trips was on Sunday where we spent a few hours walking the Millennium coastal path from Llanelli to Machynys. For an area once decimated by heavy industry its current guise is on the whole very pleasing with the new housing being of sound architectural standing (with just one painful exception) and of course there are those stunning views across the Burry inlet to Gower. We weren't there to discuss the merits of a redeveloped foreshore however and were much happier watching the numerous Redshanks feeding at Copperhouse. Also present there was a small group of six Teal and more unusually five Gadwall. The latter are far from a common sight at this location, at least in my experience, and these individuals were giving grand views just a few meters off the dock wall. 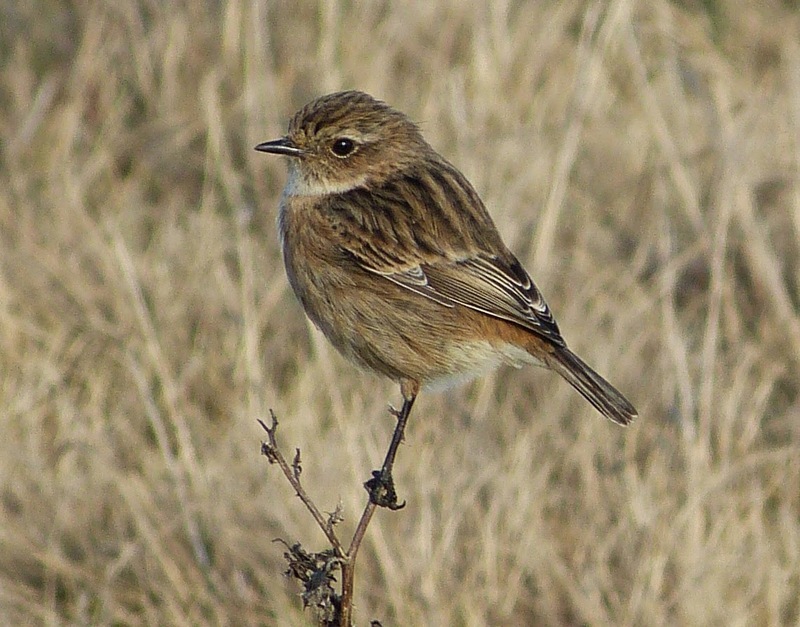 It wasn't until we'd moved around to the golf course however that I found cause to whip the camera out for a trio of Stonechats who were just begging to be photographed. As is so often the way however they immediately decided that their interests lay elsewhere. That didn't stop me persevering and I managed to capture this perky individual through the Gorse. Out on the exposed mud two pairs of Shelducks were happily feeding along with other stalwarts of estuary life including Curlew, Little Egret, Oystercatcher, Brent Goose and Cormorants. Numerous small waders were also on the move but alas too distant for my binoculars and I hadn't bothered to bring the scope. No optics at all were needed for our next encounter though which took the form of a Song Thrush buried deep within the undergrowth. In fact it was so well hidden that I only glimpsed the bird once but I'd have recognised that song anywhere. Song Thrushes are known for their mimicry and this one was an absolute star. We were able to pick out snippets of Wren, Redshank, Oystercatcher and other as yet unidentified calls during our lengthy serenade. Given such a selection it's perhaps easy to deduce that this individual has spent much of its life along the coast. Move inland and they start including less natural calls such as the bird I used to listen to in Penllergaer woods which did a note perfect rendition of a car alarm. At the pond I had hoped to find an early Sand Martin given that a trickle are now starting to make landfall but alas it was not to be. Wheatears were similarly elusive but the very fact that it's time to start looking for them is heartening indeed. Back to Saturday and a trip out to Cilsan Bridge to look for the regular overwintering flock of Whooper Swans resulted in success. 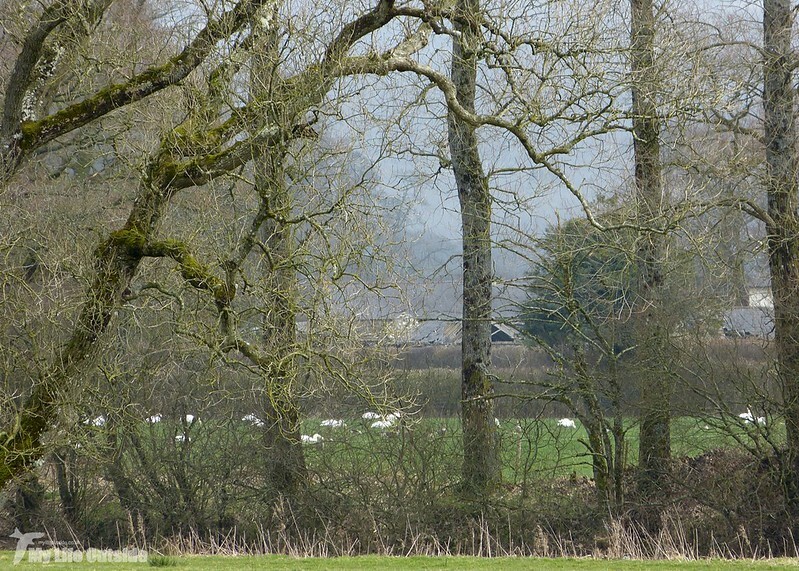 Initially they were out of sight behind a distant strand of trees but on our return a little later they had moved just enough to allow a clearer view. The result is another iffy record shot but hopefully you get the idea. Also present at Cilsan were 65 Greylag Geese and 24 Canada Geese plus two Little Grebes. More variety was to be found just downstream at Dryslwyn where four Redwing were definitely a nice find. Out on the fields another 180 Canada Geese were joined by a couple of their domestic cousins whilst overhead two Ravens were cronking loudly as they circled the castle battlements. Back down at ground level the small wooded car park delivered a male Great-spotted Woodpecker amongst the usual suspects. Star bird though has to be the male Sparrowhawk which I spotted sat in the middle of a nearby field. Presumably it had just attempted a kill, though there was no obvious evidence of success, before once more taking flight and disappearing into a hedgerow. Not bad for a non-birding weekend. I'll say not bad for a non birding weekend! 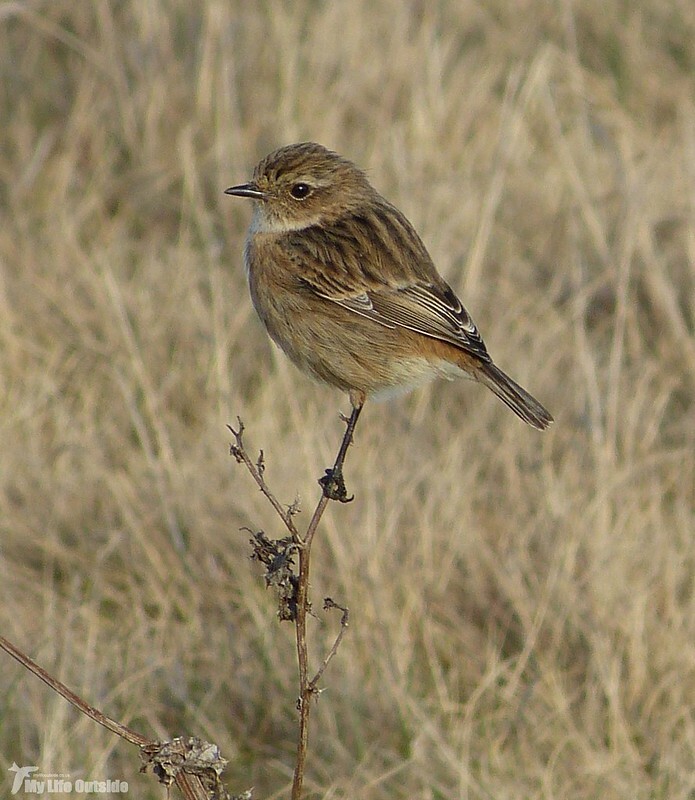 The light on your Stonechat photo is perfect!! Good you found the Swans. What a star that Song Thrush is. A grand repertoire! That's something I've noticed; how different and varied the song is, from my local birds and the ones I see when I stay in Wales. Great birds. Cheers Keith and good to hear that I'm not the only one who's noticed regional variations in Song Thrush calls.